A very good day to all my lovely friends!! Today, I am going for a hairstyle, step by step, and the final outcome. 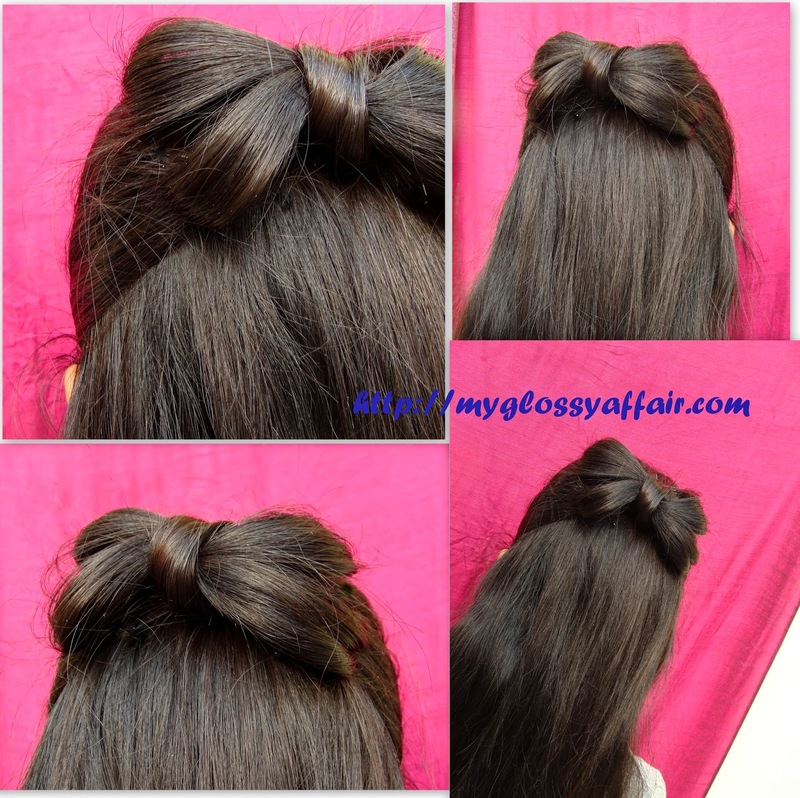 This bow hairstyle is meant for girls with medium to long and straight hair type. Hairstyles make or break your look. Imagine a girl in good clothes, footwear, accessories and all other stuff and unkempt, undone, not well looked after hair. Now, imagine another girl with average clothes and looks but fine textured hair and superbly done hairstyle. Which one would you like more!! Most of us tend to neglect our hair and give importance to face, makeup and clothes. Not done at all !! Hair and hairstyles are the best opportunity we get to enhance our beauty and personality. I have previously done some Hairstyle Tutorials. 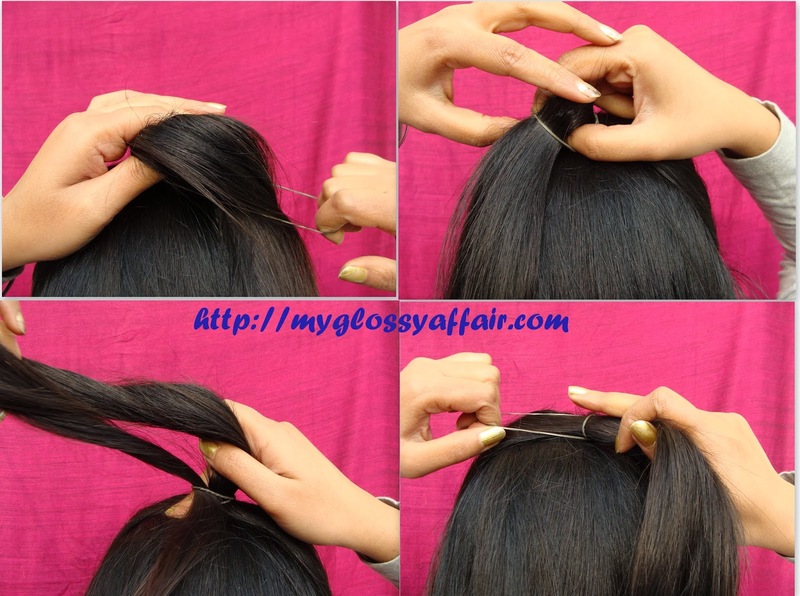 This time, it is a very very simple to do hairstyle which I bet anyone can do, obviously, if it attracts you, in 5 mins flat. Nothing much you need to create this hairstyle. – Firstly, your hair should be straight for this hairstyle. 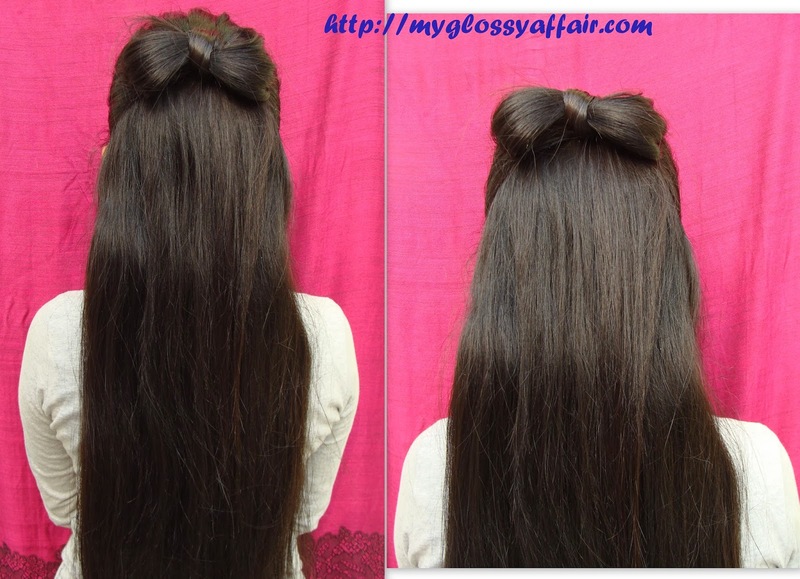 – Only girls with medium or long hair would be able to pull this hairstyle off. 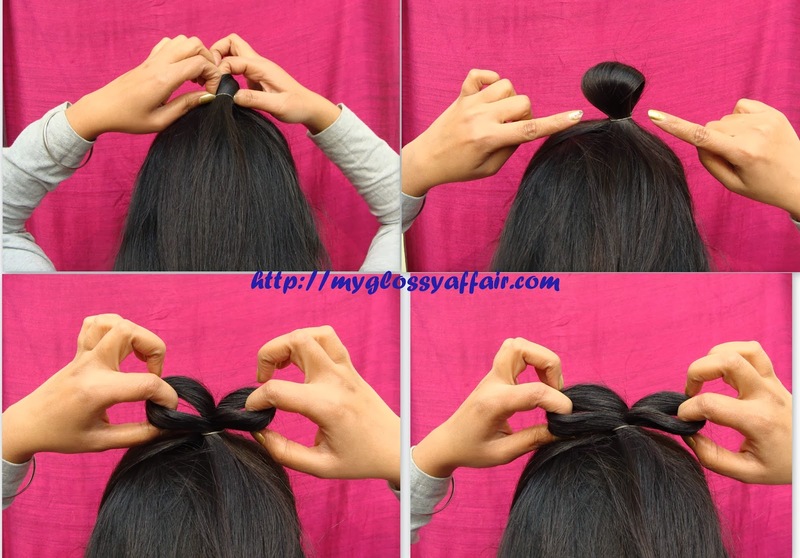 Tie them up in a tight ponytail with the help of a rubber band. Pull the section upward from the last wrap of the rubber band and pull 2 equal sections from it on different sides as shown. I have not used any other accessory but instead used a section of my own hair and rolled that in the middle and secured with a bobby pin, as shown. 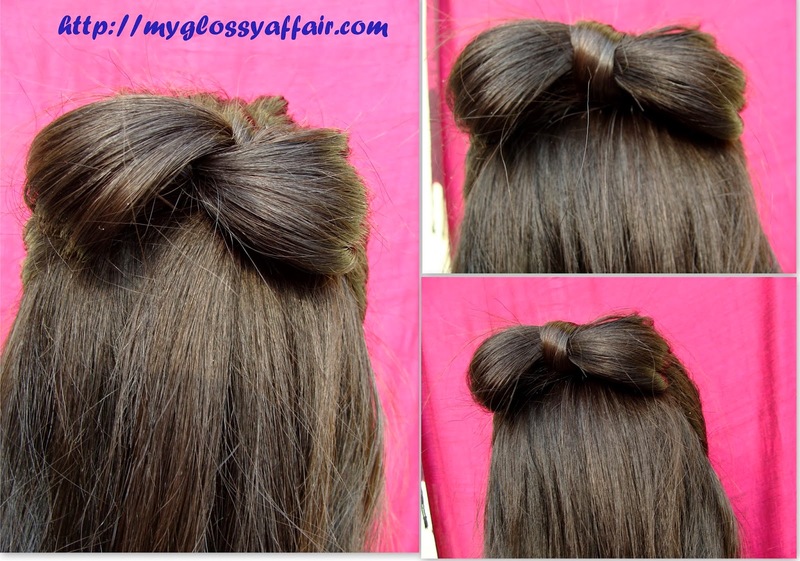 Create 2 small parts from one side of bow and secure both with bobby pins, so that it gives and impression of butterfly!! So, you see, my glossies, how easy this hairstyle is. Just a twist here and there and it is ready. Actually, hairstyles are not so tough if you have hands and creativity for them plus some tools that are mandatory. 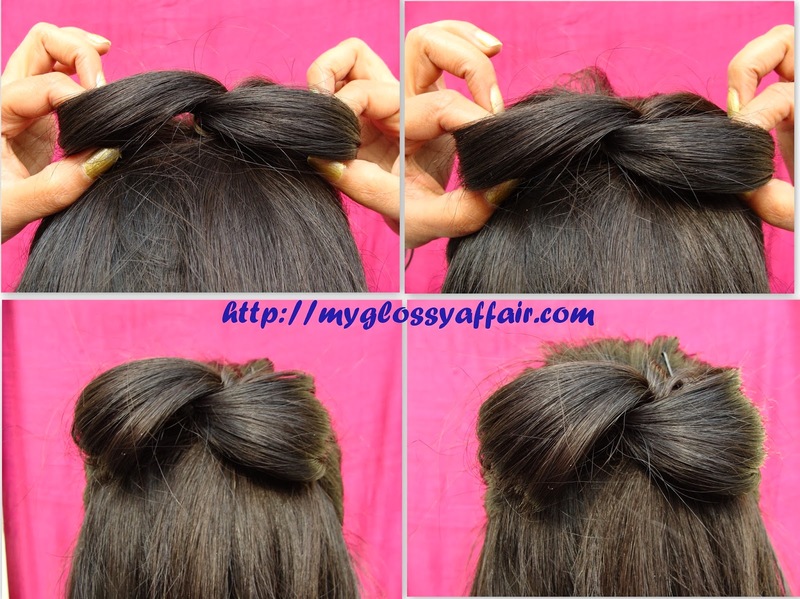 But some simple hairstyles like this one can be done without any expertise too!! Give it a try and share with me your views. That's a super cute hairdo Charu! Thanks for sharing will definitely try it out. OMG! This is so cute and simple at the same time! I loved it babes! sharing it right away! It look awesome amazing tutorial doll. Enjoy your weekend. 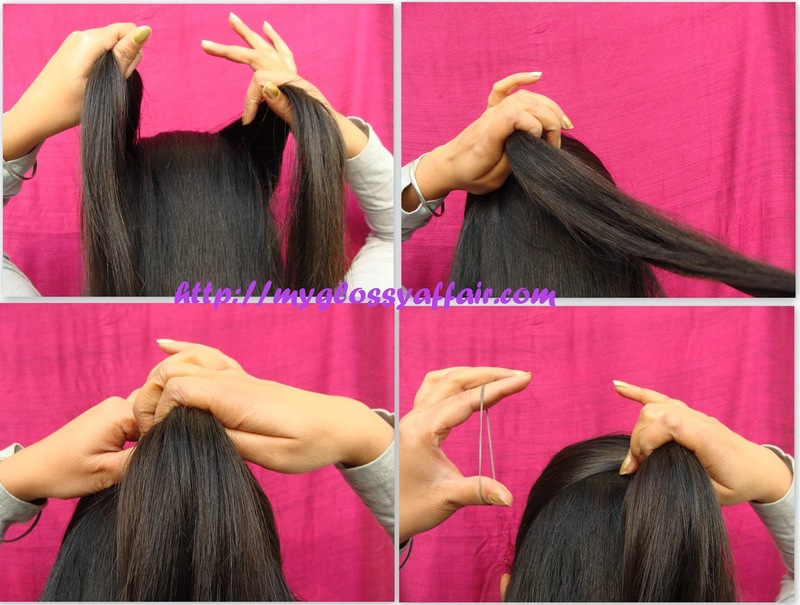 I love this hair tutorial! very easy and chic! i wish my hair was longer. Wow just loved it Charu <3 superb!!! Uauuu so cute hair style! I´m following you, hope you do the same! Thank you for your comment on my blog! It was so sweet. I followed you via google plus and GFC! Followed you on bloglovin and twitter too! This is such a cute hair style and the tutorial was really helpful. This is so so cute, love it and great tutorial! I enjoyed reading your opinion on my last post…Good wishes for the weekend! very cute…loved it! u have lovely hairs! awesome tutorial! i followed you on GFC and bloglovin like you asked! I just followed you on GFC, please follow me back if you don't mind. This is really cute! Aww I envy your thick hair! amazing hairstyle!!! I'm following you on bloglovin, instagram and on the blog!! :-),xo. cute hairstyle, I love it.. This hairstyle is gorgeous! I love that you really don't need much to pull it off too!! I absolutely adore it!!! Followed you on Facebook, Bloglovin, GFC and Twitter! I follow you now 🙂 Have a nice weekend! yes of course I'd like to follow each other, I follow you via GFC, hope you'll do the same! This is so cute! Thanks for the tutorial! Ive followed you 😀 Thanks for visiting my blog! eeeeee soo pretty! 😀 Beautiful Hair! thanks for your comment on my blog, yes i'd like to follow each other. so I'm following you on GFC, Facebook, G+ and bloglovin! plese follow me back! First of all, I love that hairstyle, it's so easy and cute. I always try it, but to be honest, my hair is not so silky and smooth, and i have short layers that make it a little complecated. hi, thx for ur comment, of course i follow u! Great post and blog! Lets follow each other? This is so lovely, great tutorial! I wish my hair was longer! You have a great blog! Love this post, that hairstyle is so cute!! Thanks for stopping by my blog, would love to follow each other, already following you! aww this looks really cute! i will have to try it! Very nice, I'm always looking for new hairstyles.